*The 1st Edition Copy, pictured above, of The Pearl of Great Price is out of print. There may be a few copies still available on Amazon. 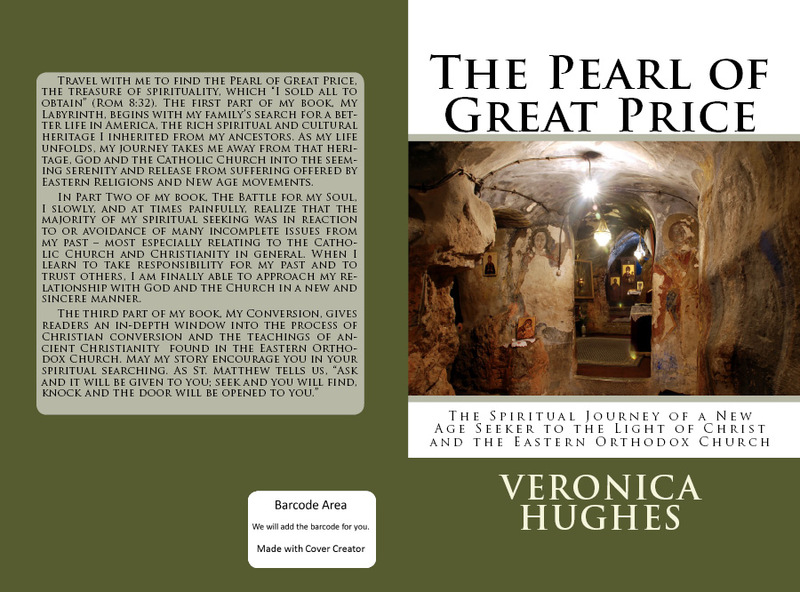 The second edition of The Pearl of Great Price is now available. Are you seeking Truth? Have you been seeking your whole life, but have not found what you are thirsting for in the New Age or Eastern religions? "I wrote this my Pearl for those who are seeking "the peace that passes all understanding" and have unresolved issues with the Catholic Church, Protestant religions or Christianity in general. How many years of my life did I spend searching for the truth? I never would have imagined that after rejecting Christianity in my late teens I would have ever come back to Christ, but I did and I have found what I was seeking." When I first starting reading this book, I was thinking, yet another confessional book written by yet another screwed up baby boomer. I have to confess that I began to like this book more and more as I kept reading and I wasn't able to put it down until I finished. 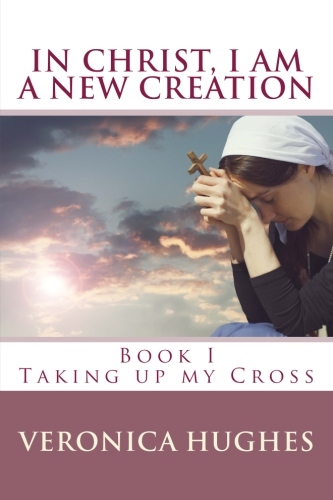 The author's journey is worth reading about, especially if you are a woman interested in spirituality and in Christianity. I appreciate that Paula Sivori (the author's real name) could tell us this story with honesty. The book is not as well-edited as I would like especially in the beginning. There are lots of parts where the writing is awkward and amateurish (good editing would have fixed this!) Otherwise, I heartily recommend this book for anyone who has been searching for answers to the meaning of life and questioning God. I started writing this book in September of 2011. By the grace of God, once more I was bathed in the Light of Christ’s Resurrection that had greeted me my first Paschal morning as an Orthodox Christian. With tears streaming down my face, I struggled to put into words the excruciatingly intimate exchange that transpired in my heart and soul with God on that blessed morning in 1997. I was hesitant to write about my experience, for the Holy Fathers caution us about revealing such things for fear the evil one will manipulate us though vanity or pride. I knew I had nothing to do with the gift that I received that morning other than I had been praying for months, even years for strength and faith to change. I was far, far away from any consistent state of virtue or purification according to Orthodox traditions, yet God blessed me to experience His Resurrection and Light for the salvation of my soul. I also had no idea how to truly be an Orthodox Christian. How could I? I was a newly baptized Orthodox Christian with a milieu of Western, New Age, pagan, and Eastern philosophies, beliefs and occult encounters ingrained into every fiber of my being. A woman with an issue of blood, who had suffered much and spent all she had on physicians, humbly and courageously touched the hem of Christ’s garment saying, ‘If I may touch but His clothes, I shall be made whole.’ And straightway the fountain of her blood was dried up; she was healed of that plague. Jesus knowing in Himself that virtue had gone out of Him, turned about and said, ‘Who touched my clothes?’ With fear and trembling Holy Veronica then fell down before Him and told all the truth. Christ said to her, ‘Daughter, thy faith hath made thee whole; go in peace.’ Glory to Thee, O Christ our God! Thy name, Veronica, means bearer of victory. Thou didst miraculously acquire the Image of our Saviour on thy veil. After His Resurrection, thou didst carry His wonder-working Image and the Gospel to those in need. Holy Mother Veronica, by thy prayers for us, help us to be victorious over our passions and the unseen forces that war against us. 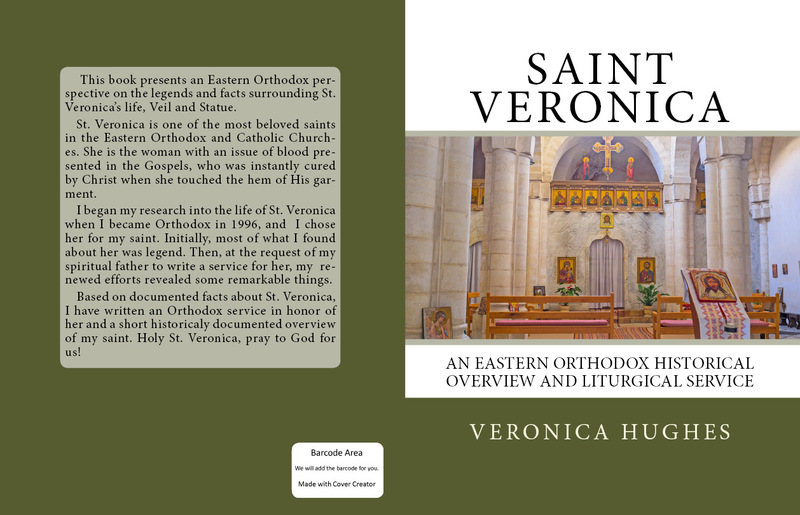 Who would not wonder at and glorify faithfully the unseen miracles of humble Veronica as she carried her veil and the message of the Gospel to all? O the wonder and glory of God given grace! Teach us by thine example, holy Veronica, to turn with faith to the Gospel and our Lord for the healing of our souls and bodies. Thy holy feast shines like the sun with the action of divine healings; for all who pray to thee are strengthened in their faith. With courage let us also follow thine example and dare to reach out to Christ for healing. O holy Mother Veronica, teach us to pray with faith to Christ for the healing of our soul and body. O Holy Mother of God, Queen of heaven and glory of the angels, send down thy loving kindness on those who faithfully call upon thee with love to the glory of thy Holy Son, Christ our God.